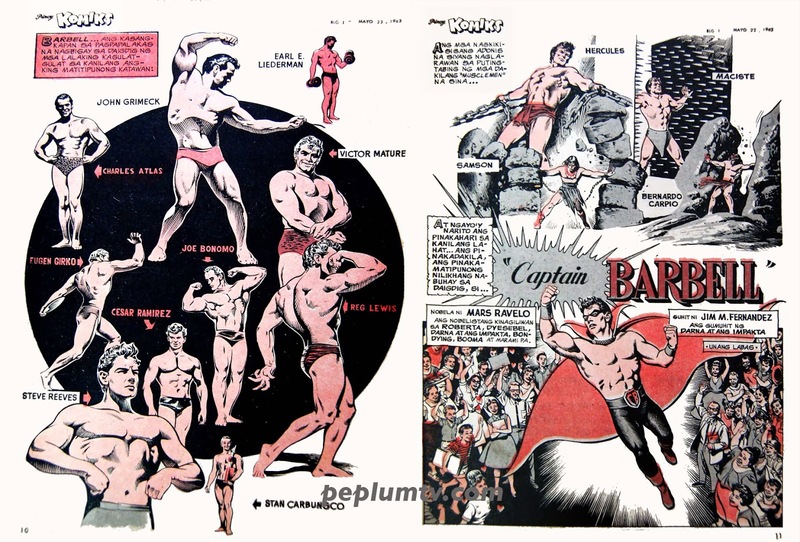 Pages from a Filipino comic book superhero called CAPTAIN BARBELL. The first issues shows a bunch of bodybuilders, most of them stars of the PEPLUM cinema, and the mythical heroes they played. Odd connection but there you go. It's also odd to see Victor Mature (drawing doesn't look like VM) amongst bodybuilders. Victor, who was always on the pudgy side, was most definitely not a bodybuilder. Several films based on the comic book have been made since 1964. Great material! I had no idea that this things existed, including "Il grande libro di Ercole" (that I hope to buy). You should edit a DVD with all this material (even best comments) and sell it, I would buy it!